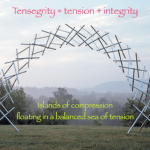 Tensegrity is an elision of ‘tension + integrity’. Buckminster Fuller, building on the highly original sculptures of Kenneth Snelson, coined the term, to indicate that the integrity of the structure derived from the balance of tension members, not the compression struts. 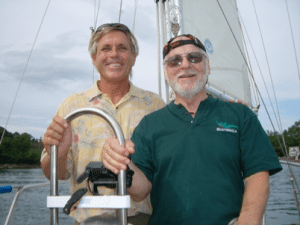 (The easiest way to understand tensegrity is to have a model in your hand – then these properties are self-evident.) Cut the strings and it would collapse totally. Most of our houses and other man-made structures are ‘compressionegrities’ – their integrity lies with the continuity of compression from the highest brick in the Empire State Building to the lowest block of granite – the compression runs in an unbroken line from element to element all the way to the ground. We have thought of our bodies in the same way: the skeleton is a stack of bones, like a stack of checkers – a continuous compression structure – with the individual muscles hanging off each bone to move it. But every classroom skeleton you have ever seen is wired together. Similarly, in the actual skeleton the bones float in a sea of soft-tissue. Fascial continuity suggests that the myofascia acts like an adjustable tensegrity around the skeleton – a continuous inward pulling tensional network like the elastics, with the bones acting like the struts in the tensegrity model, pushing out against the restricting ‘rubber bands’. 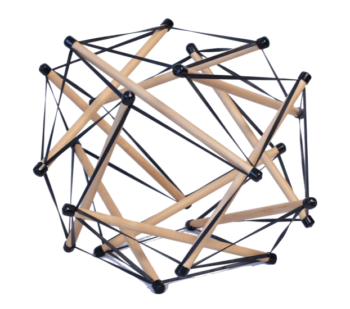 Playing with these models reveals several unique features: Put strain into a tensegrity structure and the deformation will get distributed all over the structure. Continuous compression structures like buildings do not show this property, but bodies do. Load one corner of a building with a huge amount of snow, and that corner might collapse, leaving the rest of building intact. Load a tensegrity, and it will distribute the strain around the whole structure. Ergo: Where will a strained compression structure break? where the strain is greatest. Where will a tensegrity structure break under strain? At its weakest point. 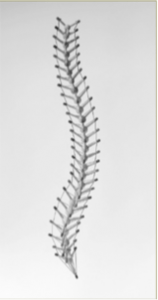 If we are a tensegrity structure, the ‘load’ that is causing pain or strain in the low back may be sourced in the foot or the shoulder – so we have to be able to see the pattern to know where to intervene. 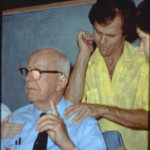 Erik Dalton says, “Don’t chase the pain!” Ida Rolf said: Where you think it is, it ain’t.” Both of these point to the tesnegrity nature of the body. Often our clients’ bodies are contracted and retracted and immobilized in some ways, in some parts. We want to engender an opening, expansion, a filling of space until the person is fully expressed, not constrained. Tensegrities expand in all axes at once: open the structure in one dimension and every dimension expands. Neither buildings nor balloons display this property, but tensegrity structures and bodies do. Tensegrities can be built in hierarchies – each element of a tensegrity can be built out of smaller tensegrities – making for the most efficient use of materials, an evolutionary imperative. This efficiency is also a very important property, as the rule of biological evolution is efficiency – getting the most performance from the least material. 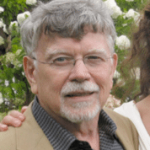 Research into fascia has shown how it works on many levels as a distributive network. The body is at least responding like a tensegrity structure, and many of us believe that it is operating as a tensegrity structure. Perhaps it operates more like a tensegrity structure in Fred Astaire than it does in Jackie Gleason.